A number of structured design methodologies have been adopted in past decades, to identify the best path for creating most befitting online learning courses and content. The basic intent behind all had always been to deliver superior solutions while addressing client requirements accurately and further getting down to facilitate learnings. -Rather than planning and developing entire project at one go, it is split into smaller, faster iterations. -Feedback is sought from client in each step. Development of a full blown Learning Management System can be exhaustive task with elements like programmes, subjects, modules, tests, assessment and discussion forums all integrated in a single platform. The system is also expected to witness scalability which can accommodate growing number of learners requirements at later stages. Hence, a lot goes in designing and creating full fledged e-learning courses. Iterative development calls for splitting the entire project in cycles, finishing one at a time, taking feedback and perfecting it before moving on to next to build the entire project. In creating an online learning system, this gets implemented with lessons or courses. We focus our energies in making small starts, going for trials and tests of it, understand user behaviour, incorporate feedback, improve and repeat the cycle. Creating bits of LMS, soliciting inputs to get whatâ€™s missing, what else theyâ€™d like to learn or wished, helps in improving tremendously. With existing courses, a typeform survey can also be resorted, to take a precise feedback and help plan further. This process helps in succinctly addressing the learners requirement and renders pleasing results. An iterative system of development is considered to be fast and flexible. This approach of gives liberty of alterations in each iteration. Changes at this stage can be easily accommodated, doing away the need to make major changes, ones the entire product is ready.This compresses the overall development time. For development of an apt LMS, collaboration of stakeholders is must. Each of them, be it learners, clients, project managers, developers or designers. They all play a crucial role in entire process of development. Right from the start of the project till the completion, none of them is left out to could be few stakeholders.One of the basic advantages of this is, it lets us understand thoroughly client requirements, align with their requirements and enhance during each iteration. A thorough assessment and testing of any product or solution ensures usability, performance and user experience. Ones the development has taken place completely, inviting a group of users to go through the course before it goes live, assists in accurate assessment of product deliveries. Inviting a group of learners to go through course, process feedbacks and implementing it before going live makes a huge difference in performance. This process gets repeated to ensure that the courseware become flawless. Implementing such changes becomes easier and practical with small iterations in development. With adoption of iterative development cycles resulting in extensive collaboration, exhaustive testing and implementation of feedback in LMS, the final deliverable is ought to be in complete sync with requirements. 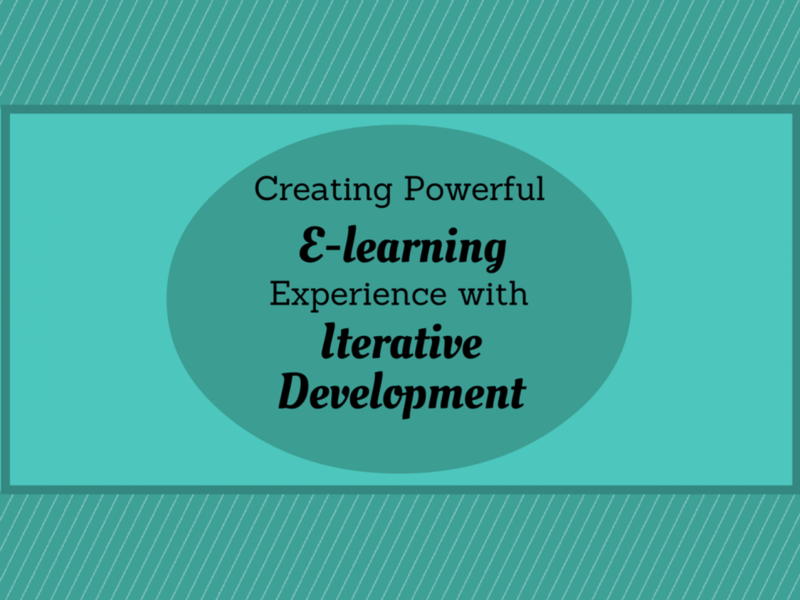 It offers an outstanding online course to create powerful powerful learner experience.